Iranian entrenchment in Syria is becoming a global issue. It has been raised before security decision makers in Washington and in Moscow. It is now assumed that the increased Iranian presence in Syria may be a trigger for regional war. A newly issued intelligence report, by analyst Ronen Salomon, summarized in bridgesforpeace, traces the deepening entrenchment and growing influence of Iranian forces in Syria. According to the above mentioned summary, the report details regions of Syria under Iranian military control (including Damascus International airport region, command outpost in Dumayr area and bases on mount Qasioun), organizations, companies and special spaces manipulated by Iran (among them Iran Air, Mahan Air, Iranian Red Crescent and companies connected to Iran’s international shipping company), and illicit Iranian covert military activity (including airlifts, sea transportations armament production infrastructures, long range missile manufacturing plants). It is assumed that no less than 18000 Iranian backed fighters, of different militia, are present in Syria, including Hezbollah and Iranian military personnel. 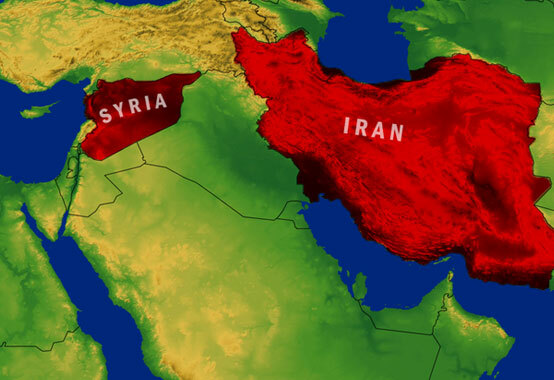 While the Iranian foothold in Syria is disturbing, as further expansion of Iranian influence, the real issue of concern is the fear of regional war developing from Iranian entrenchment in Syria. The possibility of military engagement arises from two different courses of action. Many mainstream media outlets and think-tanks related to the possible “collision” between the US and Iran in Syria (see for instance foreignpolicy piece titled are the US and Iran on a collision course in Syria, businessinsider report titled The US, Russia and Iran are edging closer to an all-out clash in Syria and thenation observing that the Iran US drone war in Syria could quickly spin out of control). Taking into consideration the perpetual navy altercations between Iran and the US in the wide seas, for no reason, it is not so unrealistic that close geographical military proximity in Syria could bring about open military conflict. But there is also a second collision course, which could lead to regional war. The possible collision between Israel and Iran is no longer a cold war, but a bubbling cauldron. When Hezbollah plans terrorist attacks against Israeli or Jewish targets, Israel acts to thwart them. As reported in ynetnews, when Syrian territory has been used in the past for covert armament smuggling for the Hezbollah, such shipments have been militarily intercepted. “Concern” in the past has transformed into “grave concern“, regarding possible Iranian military foothold in Syria and especially in the Golan Heights, on Israel’s northern border. Due to the fear of missile launches or cross border attacks, Israel vows to deny Hezbollah/Iran military entrenchment on its northern border. Now we can imagine a scenario according to which, Israel intercepts armament to the Hezbollah, Iran responds from its entrenchment in the Syrian Golan Heights, and you have the ideal recipe for regional upsurge. Iranian presence is certainly a trigger for unexpected developments. It is surprising that this potential “second collision course” is not taken seriously, politically and media-wise.